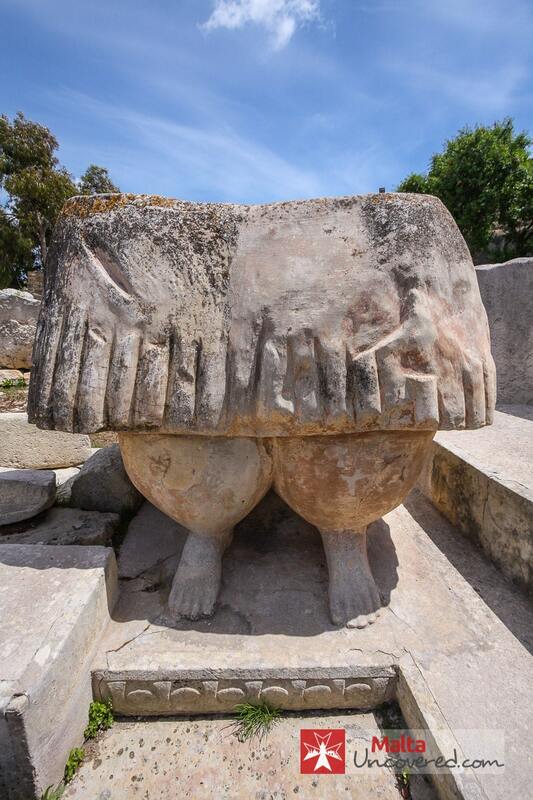 A complex of four megalithic temples make up The Tarxien Temples site, which is located in the heart of the village of Tarxien. 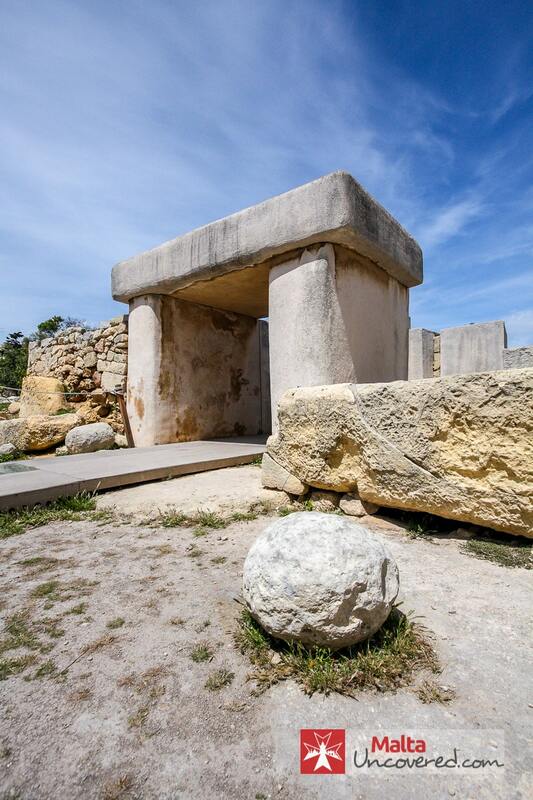 Its location is around 400metres to the east of the Hypogeum of Ħal-Saflieni, another one of Malta’s famous temples. Built between 3600 and 2500 BC, this complex is the largest prehistoric site on the islands and is now a UNESCO World Heritage Site. Perhaps it’s not the most impressive temple complex in Malta, however, there are some unique items that make it worth a visit, such as exquisite examples of prehistoric art, including the lower part of a large, skirted statue, the famous spirals and reliefs of two bulls and a sow. Three of the four temples are constructed in the same five-apse plan of the other temples on the island, however, the central temple is unique in its design, having six apses. Most probably the central temple was also roofed. The original purpose of the temples was probably that of animal sacrifice, confirmed by reliefs of animals, a number of altars, animal bones and the presence of tools such as a flint knife. Human remains were found at the centre of the South temple and experts think that this is proof that the temples were re-used during the Bronze Age for burial. Local farmers discovered the temples in 1913. The excavation was carried out between 1915 and 1919, with three of the four structures being reconstructed by Sir Temi Zammit (a renowned Maltese archaeologist and historian, professor of chemistry, medical doctor, researcher and writer) during the process. Stone spheres found during the excavation may perhaps shed some light on how our prehistoric forefathers managed to carry around the megaliths (huge slabs of stone). The prevailing theory is that these spheres were used as stone rollers to carry the megaliths from where they were quarried to the final location. Since 2015, as is the case with the temples of Mnajdra and Ħaġar Qim, the Tarxien Temples are covered by tent-like shelters to protect the site from the elements. Note that the images in this article were taken back in 2009 when the canopy shelter had not yet been erected. The Tarxien Temples are the largest temple complex in the Maltese Islands with four constructions in one site. Three of the four temples are constructed in the same five-apse plan of other temples on the island, with the fourth temple having six apses or chambers. They hold unique examples of prehistoric art, including part of a large prehistoric statue thought to represent the goddess of fertility, iconic spiral motifs and reliefs of two bulls and a sow. To get to Tarxien Temples you can go to Valletta and catch a ride on bus routes 84, 85 or 88. The trip takes around 40 minutes. Monday to Sunday: 09.00 – 17.00hrs. Last admission at 16.30hrs. The complex is wheelchair and pushchair friendly, however, these cannot be wider than 62cm. A wheelchair is available on site free of charge upon request.